Shoeb Ahmed Masud Awarded by IBA Alumni | Business Automation Ltd. Recently IBA Alumni Association has awarded 10 IBA graduates for their outstanding contribution in different sectors. The award in category “ICT” has been given to Mr. Shoeb Ahmed Masud MBA, Director, Business Automation Ltd. for his contribution in this sector. 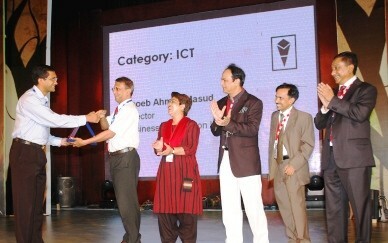 The award was handed over by Dr. Muhammad Ziaulhaq Mamun, Professor & Director ofÂ IBA, Dhaka University. Mr. Masud has graduated from IBA in 1996 and started his business career. He is one of the co-founders of Business Automation Ltd. in 1998 which has done a lot of landmark ICT projects in Bangladesh. He contributed in the industry representing on various professional bodies ( including BASIS ) and committees for last 10 years.